Well, this post won’t be going live until after this little baby is born. But right now, I am currently six months pregnant and feeling every little bit of it. I know that I’ve kept my entire pregnancy offline, and by the time baby is here, you’ll all know why. Since this is the first I’m looking at these photos, the first thought that pops into my mind is that I’ve done a very morbid maternity shoot. But alas, although these photos are documenting me growing a tiny human, the main point is to share with all you female funeral directors out there how I’m dressing for work while also expanding at the waist. As you all know, I basically only wear dresses. This has come in very handy during this pregnancy because I haven’t had to go through the shock of not being able to button up my favorite pants (spoiler, I don’t have a pair of favorite pants…I hardly have pants at all.) Because of my love of dresses, I’ve been able to get away with not buying any maternity clothes as of yet. Instead, I’ve just been wearing very loose dresses. To try to make myself look like I have even a tiny bit of a shape, I’ve been wearing belts. I’m past the point of hiding this baby, so might as well show off the bump. Also, six months pregnant and still wearing heels. I know that this is crazy but honestly, I don’t want to be logical. I can still get around on them and they make me feel more like myself. I feel very out of control when it comes to many things in my life nowadays, so wearing heels still makes me feel like me. Maybe next month I’ll invest in a pair of flats. Or maybe I’ll wear heels when I give birth. I’ll keep you posted. 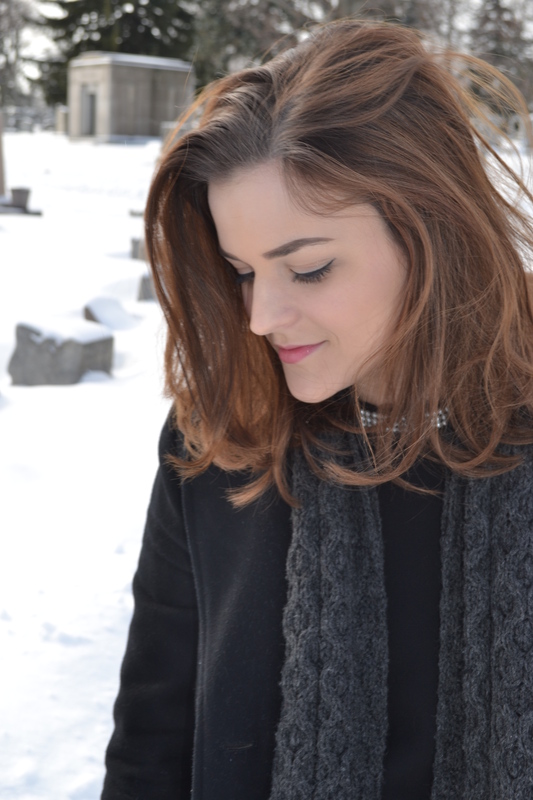 My husband Josiah LeRoy took these photos of me in St. Stanislaus Cemetery in Cheektowaga, NY. What Little Miss Funeral Wears (blue pants addition). Two outfit posts in a row?! I know, but do you know what? I don’t care. When you’re surrounded by death every single day, it’s good to be able to focus on something that brings you joy. Even if it is clothes. This post is actually a little different for me, because in case you didn’t notice, I’m wearing color, but to go even further, I’m wearing PANTS. You see, I saw that Dia&Co had this initiative where you put together an outfit that is outside of your comfort zone. Dia&Co is a clothing brand for woman sizes 14 and up, and even though I do not fall into their sizing, I have become obsessed with their message. Being confident in yourself and your outfits. I’ve said this before, but when I wear clothes that make me feel good, I truly believe that I can better serve families. So much of my job has to do with dealing with the community, and even if people don’t admit it, I am being judged. I’ve known that people judge me based on my appearance from the very first time someone walked into the funeral home and asked if my dad was working. I still know this to be true today, when people come up to me and ask to speak with a funeral director. I know that I don’t look the part; that’s why clothes are such a big deal to me. When I feel good about how I look, I can confidently talk with others and be the best funeral director that I can be. I love being a woman. I think this is why I feel so confident in skirts and dresses. So I wanted to prove to myself that I could feel just as good in a pair of pants. I love color, but hate how I look in it. I have a few beautiful and colorful pieces that I keep in my closet but rarely pull out, and I felt like these blue pants really helped me shy away from my black/gray/white color scheme. Regardless, I loved how I felt in this outfit and wanted to share that with you all. We should share things that bring us joy, right? I know that I have been lacking when it comes to blogging, and even though this is not a funeral related post, I loved this dress too much not to share it! Yesterday I had a family wedding and I bought this dress specifically for this event. I fell in love with the cape first (which can come off, but I mean come on, look at it!) The thing that I love most about this is that I could (and will) wear this dress to work at the funeral home. It’s a great length, super comfortable and I could throw a blazer or cardigan over it. The shoes are one’s that I’ve had for over a year now and they’re super comfortable and I wear them to work all the time. The bows are just too cute! My husband Josiah LeRoy took these photos of me in Ridge Lawn Cemetery in Cheektowaga, NY. This post is a little bit different. I was challenged by ThirdLove, which is a bra and underwear company, to style an outfit around a strapless bra. My first question to them was simple; you know I’m a funeral director, right?! After thinking about it for a minute, I figured that it wasn’t such a bad idea, since many people who check out my outfit posts are women, and you know, we use that stuff. The only thing was, I was trying to think of a situation where I would need a strapless bra for an outfit within the funeral profession. Enter the WNY Funeral Directors Golf Outing. Even though this was the 5th year for the golf outing, this was my first time volunteering. My friend Jack actually created/organizes/runs this event, and all I can say is…wow. The money raised benefits the local Women and Children’s Hospital in Buffalo, and the amount of hard work that goes into it is incredible. I asked Jack what the dress code was and he said casual. This outfit ended up being my interpretation of ‘casual’. There’s actually a funny story behind this outfit; one day, I was with my mom and she wore this exact jumpsuit. I immediately became obsessed with it and when I found out that she recently got it at Old Navy, I went out and bought one for myself. The only thing is now I have to tell her when I’m planning on wearing it so we don’t show up someplace like twins! If anything, I think it just proves that I have a stylish mama! Since I’m so short, I almost always wear a heel. Because I was going to be on a golf course all day, I wanted to try to be a little practical, so I wore these Aerosole wedges. Honestly, they were so comfortable and my feet didn’t hurt at all! Lastly, I might have been a little extra, but I threw on this wide brim hat because I’m honestly afraid of the sun and didn’t want to burn. Pale Lauren – 1, Sun – 0. Overall, over $10,000 was raised from this event! If you’re interested in donating anything as well, you can do so here! And that bracelet that I’m wearing? That’s for the Lucky Fin Project. Jack has a beautiful baby girl who was born with a limb difference and we raised some money for that charity as well. It’s something that I never even heard of before and it was awesome to be able to learn more about it. It was such an a great day and I’m really looking forward to volunteering next year. I can already hear all of the traditional funeral directors disapproving this particular look. I mean, one of my own funeral associates even looked at me and said “What are you wearing?” But you know what? I loved this outfit. I felt confident in this outfit. What more can a girl ask for when she gets dressed? For those of you who may not know, for the past year I have been taking ballet classes. I’ve never done ballet before, although I’ve loved it for as long as I can remember. I love the grace, softness and femininity that comes along with ballet. And yet, there is something strong and disciplined about ballerinas. It’s the perfect mixture. So the moment I saw this skirt from Pink Peonies blogger Rachel Parcell, I knew I needed to have it, even at the high price point. I normally don’t mind investing money into pieces that I can get a lot of wear out of, but this one was hard for me to justify. I actually couldn’t justify it besides for the fact that it looked like a tutu and was pretty, so I held my breath and closed my eyes as I hit “purchase” on her website. Hashtag no regrets. Now, I wore this outfit Friday and had no funerals or visitations scheduled. If I had, I would have chosen to wear something a little more Wednesday Addams rather than Rachel McAdams, but since I was just doing paperwork and running around I decided to branch out of my comfort zone. Funeral directors don’t have to be doom and gloom all the time. And honestly, this was the first time in a very long time that I did not wear black, so it deserved to be photographed. Also yes, my hair is blonde. My husband Josiah LeRoy took these photos of me in Mt. Calvary Cemetery, Cheektowaga, NY. I didn’t start my day with the idea in my head that I’d be blogging my outfit, yet here we are. Today was supposed to be calm. I went to bed last night thinking that all I had to do at work today was to meet a family for a visitation. Oh, how wrong I was. Shortly after my alarm went off this morning, my phone rang. It was my boss letting me know that we had gotten two death calls in the middle of the night and I had to meet both families. At first I didn’t think it was a problem since I had nothing on my schedule, so I got dressed and drove to work. I am a fan of dresses. I’ve said this a million times and I’ll say it a million times more. They are so easy for me to throw on in the morning. I’ve been putting belts on them to cinch the waist because so many of my dresses are shapeless, but they are oh so comfortable! It was cold this morning (I live in Buffalo, so it doesn’t matter if it’s June, it can still be cold!) so I wore some tights. Quickly add a necklace, put on my favorite shoes and I was out the door. I got to work and nothing went as it should have. My easy day quickly turned into a running all over the place doing fifty things at once kind of day. It’s okay, though, because I got through it. Everything ended up working out, even if I mumbled one or two bad words under my breath during the process. I decided to blog about my outfit when I got home because when you’ve had a crazy day sometimes you just need to spend some time with your husband as he tries to make you laugh for photos. No matter what, I can always count on him to put a smile on my face. I am a blessed lady. My husband Josiah LeRoy took this photo of me in St. Stanislaus Cemetery, Cheektowaga, NY. Thanks for making me smile, B. What Little Miss Funeral Wears (when she has NOTHING to wear). I have been a very busy person for the entire month of May. It all started out with a family vacation that somehow managed to sneak up on me in the beginning of the month. This was something my parents had planned for us months ago, and in the back of my head, it had always seemed so far off. But one day, I blinked, and I had to have a bag packed full of bathing suits and beachy dresses. Somethings that I just don’t have in my wardrobe. When we came back, I found myself on the road going to Ohio for their Funeral Director Convention. I spent two awesome days there where I spoke on the topic of Compassion Fatigue. By the time my husband and I got home, we found ourselves busy again with his company, The Geekiverse, and Buffalo’s Nickel City Comic Con. If any of you follow me on Instagram, you would have seen me dressed as Snow White for this event. Needless to say, by the time all of these things were over, my husband and I found ourselves drowning in laundry. Literally. If you were to open my closet right this second, you would find about three black tops, one short skirt and a handful of dresses that I haven’t worn in years, but that I like enough to keep. And so begins our journey for this “What Little Miss Funeral Wears”. Being in a rush and upset at myself for not thinking ahead, I grabbed this dress that I bought last year for a wedding. My mama had been encouraging me to get outside of my color comfort zone and in purchasing this navy blue dress I had hoped that we had come to some sort of compromise. My only dilemma, it seemed to ‘wedding’ for me. (Maybe not, but I associated this dress with a wedding which meant it didn’t seem funeral appropriate to me.) So I grabbed a belt that I had not touched in over a year and cinched the waist. I then threw this old cover up over it, looked in the mirror and didn’t fully hate what I saw. I wanted to include two photos today, because I can’t stop laughing at the first one! My face in it is so funny! I had just finished yelling at my husband for taking selfies of himself and thought you all might get a kick out of my death stare. It’s not too mean here because my husband is the cutest around so even when I’m mad at him I can’t stay that way for long! What Little Miss Funeral Wears (when it’s cold outside). What do female funeral directors wear when they have to conduct funerals? What do they wear when they have to conduct funerals and it’s a little (or a lot, let’s be real) cold outside? Growing up outside of Buffalo, I am no stranger to winters. It’s cold here. It snows a lot here. And unfortunately…we’re used to it. I’m actually convinced that my body has adapted to the cold so well in fact, that if it’s not in the negatives (temperature wise) I think it’s a good day. But the fact still remains; a large portion of my job takes place outside. I have a large collection of coats. I hope to eventually show all of my ‘funeral’ coats to you folks through this blog. But one that I have been loving recently is this Calvin Klein number that I purchased this year. I love coats that hit below your waist. The longer the better because more of your body is covered for warmth! Say what you will on my choice of shoes, but unless it is blizzard weather or severely icy outside I still try to wear a boot with a heel. (Short girl problems, whatever). These uggs have been with me for a couple of seasons now and they keep my feet very warm while not looking clunky. Also, I’m not wearing them in my photos, but I recommend getting a pair of leather gloves. I’ve had a few different pairs and my leather ones are still the warmest I’ve found. When it comes down to it, cold is cold! It’s a constant struggle between looking professional and staying warm. I know my fellow funeral directors who live in snowy areas will agree with me, although the winter can be a beautiful time, maybe it would be a little more beautiful if it didn’t last as long as it does! These photos were taken by my husband Josiah LeRoy in The United German & French Cemetery, Cheektowaga, NY.